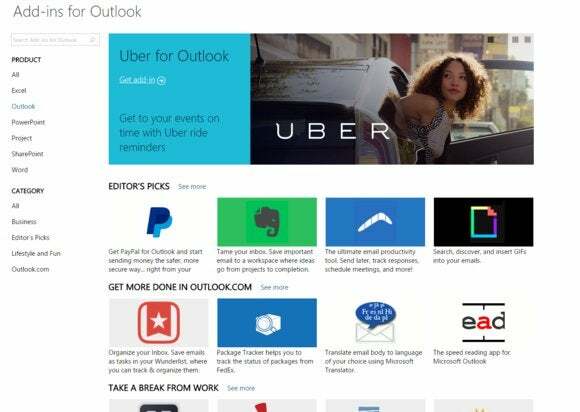 At Microsoft Build last week, Microsoft showed off Office’s newfound ability to pin apps to your ribbon, theoretically allowing you to send a Starbucks gift card to a friend directly within Outlook, for instance. But this extensibility already faces a challenge: No one knows how to find the plug-ins. Microsoft has long had an Office apps store, with downloadable templates and plugins, generally for Office 2013 or later. These plug-ins can be really useful: Anyone who’s ever purchased a house or signed a loan agreement has probably used DocuSign, which replaces the irritating back-and-forth of faxed documents with an electronic signature. 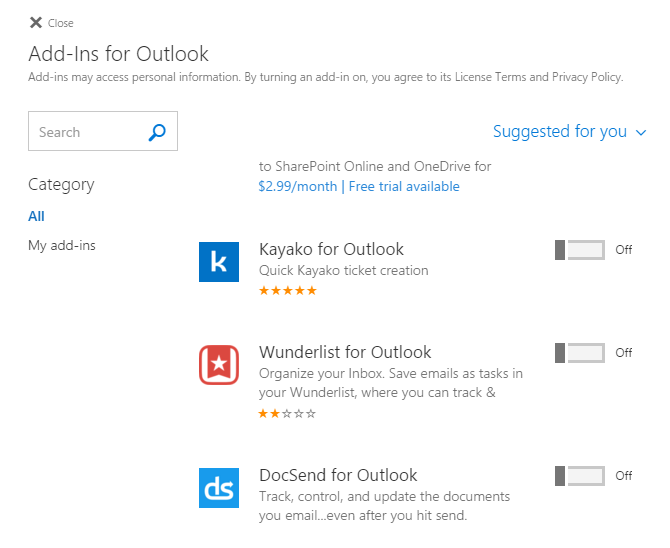 Office 2016 has begun to make those plugins just slightly more accessible. Within Outlook 2016, for example, you’ll see a “Store” icon to the upper right of the ribbon. But that’s the only Office app where you’ll see that icon appear. Outlook.com provides an actual in-app experience for downloading plug-ins, but they’re hidden behind the Settings gear icon—all 70 or so of them. This Google Chrome-like list of toggled Office plugins is hidden behind the Outlook.com Settings “gear” to the upper right. Why this matters: Microsoft would like users to consider extensibility an advantage of the Office platforms, and an incentive for upgrading to Office 365. But there’s no easy way to actually find that capability within Office 2013—which makes the feature a hard sell to users, and therefore, also developers. That’s the problem Microsoft is wrestling with, acknowledged Rob Howard, director of Office 365 ecosystem marketing (no relation to Robert Howard, the co-founder of Microsoft’s Cortana.) While you can already see the first fruits of its efforts, there’s a long way to go. Right now, word of mouth suffices. Howard said a number of Microsoft executives are hooked on FindTime, which allows team members to collaboratively find a good time for a meeting. Howard also said that he’s integrated the Uber plugin, which knows his schedule, his location, the traffic, and the location for his next meeting, and automatically pops up the Uber app at the appropriate time. Microsoft also recently announced Connectors, which allows different services to squirt data into an Office 365 workflow. Brandfolder, which brands can use to manage brand media assets, recently published a Connector to send brand change events to the Office 365 Group in real time. Here’s the difference: Plug-in apps use the full power and flexibility of the Web, Howard said. Connectors treat a piece of data like an object or a card, and suggest a few actions to act upon it. Both, though, pull this data from outside sources. Over time, culling this data from outside sources has become part and parcel of the Office experience. In Word 2016, for example, you can pull up a real-time window on the right-hand side of the screen to ask Cortana to hunt down information for you. But that capability is right in front of the user. 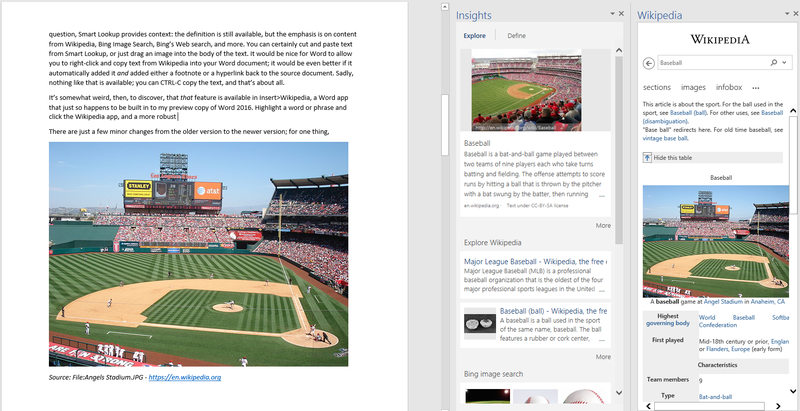 You can turn on a feature called “Insights” to help you add context to subjects you’re writing about in Word 2016. Howard declined to say specifically how Microsoft would make the plug-ins more visible. Obviously, Microsoft has a Store app, that it could use to surface them. Placing larger icons in the ribbon would also help. It’s possible that admins pushing plug-ins to corporate workers across a network might raise awareness of the technology, Howard agreed. Apps within Microsoft Office have also begun promoting their own app updates in splash screens when they launch. Microsoft needs its users to keep paying for Office, and to spur them on, it needs to keep increasing its value. But if customers don’t know what that value entails, it’s all for naught. The bottom line: It may take a while, but expect Office plug-ins to become much more visible.